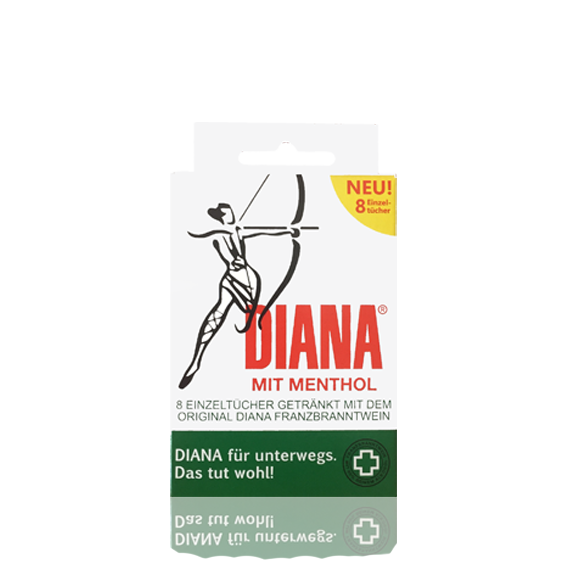 Products | DIANA mit Menthol, das tut wohl - seit 1897! DIANA rubbing alcohol is available in the classic glass bottle of 100ml and 250ml and in the 125ml plastic bottle with pump spray for when you are on the go. Especially the pump spray makes dosing even easier and the small, lightweight bottle fits in every pocket. 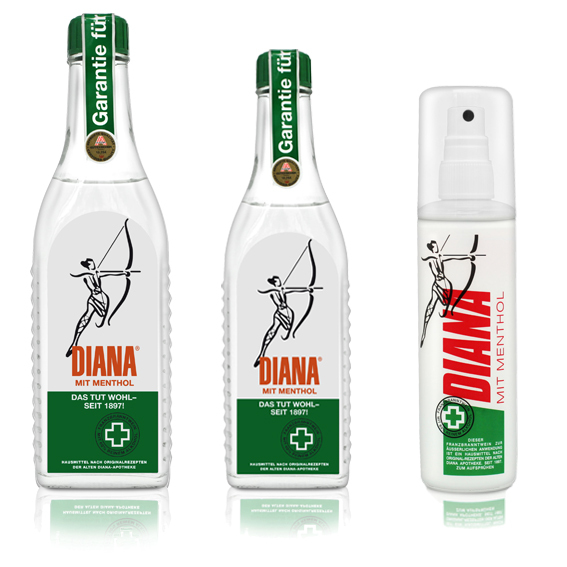 DIANA rubbing alcohol for rubbing is a home remedy according to original recipes of the old DIANA pharmacy since 1897 and has firmly established itself on the Austrian market for the last 120 years. DIANA rubbing alcohol promotes blood circulation, the natural menthol cools the skin and provides immediately noticeable relief. It will make you feel fresh again, relax your muscles and enhance your well-being. DIANA Sport Balsam is available in a glass jar of 125ml or in a practical tube of 75ml, ideal for when you are on the go. 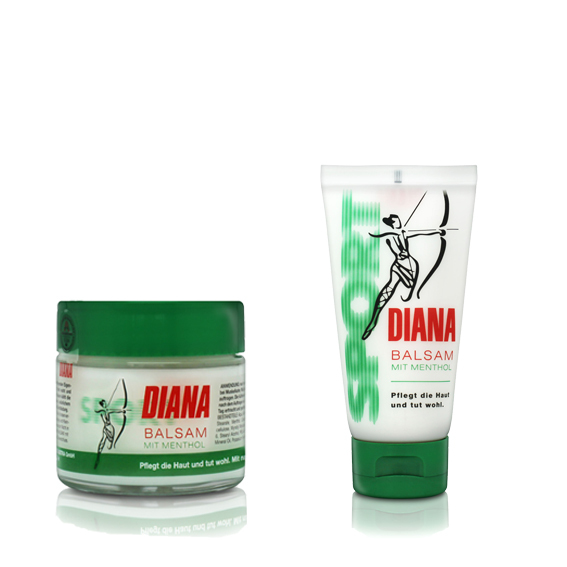 DIANA Sport Balsam cools the skin with refreshing, natural menthol and promotes blood circulation. DIANA Sport Balsam has the nourishing properties of a cream, is non-greasing and absorbs quickly. You feel refreshed and well cared for the whole day. The individually wrapped refreshing tissue are impregnated with original DIANA rubbing alcohol and are the perfect companion at work, while playing sports or when travelling. The perfect freshness kick for when you are on the go in proven DIANA quality since 1897! Insider tip: rub your neck and temples before long drives! DIANA Spirit of Melissa is available in the glass bottle of 100ml and 250ml. DIANA Spirit of Melissa is a versatile and natural home remedy. 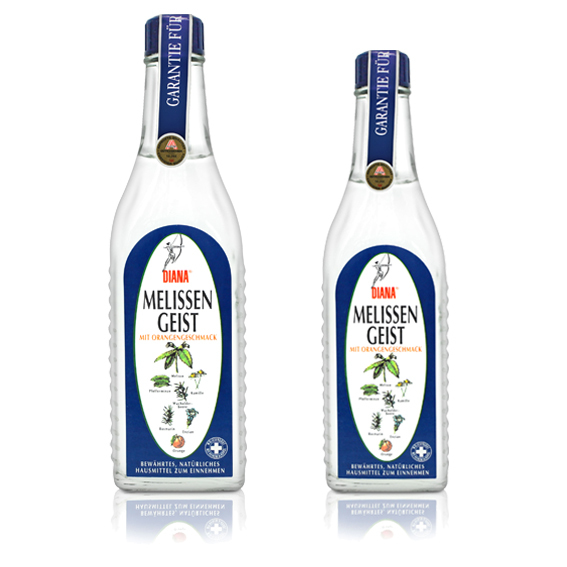 With the power of Melissa and a number of valuable herbs such as chamomile, gentian root, anise, peppermint, rosemary, juniper berry and ginger, DIANA Spirit of Melissa covers an extremely wide range of applications. In addition, DIANA Spirit of Melissa contains natural essential oils of orange, which provide a refreshing, pleasant taste. DIANA Spirit of Melissa is not only pleasant, but also tasty and can therefore be taken undiluted in contrast to pure herbal distillates.